I went abroad for the first time ever to attend GDC 2018, and it was kind of stressful to change up my usual eating habits. For Japanese people, Japanese food is always number one! That being said, I had some delicious food during my trip to San Francisco, so I will rank my top 3. I’ve never seen these before in Japan, but I saw them for sale everywhere I went in San Francisco. They even had them at gift shops and stores in the airport, and obviously they had them at the grocery store too. For flavors they had Coffee, Vanilla, Mocha and other kinds. For the 300ml size it was around 3 dollars. I thought that it was kind of expensive, but either way it tasted really good. They are very sweet, so these bottles are probably not a good choice for people who like to drink plain black coffee. I drank about 4 or 5 during my weeklong stay haha. It was so good that I easily drank one every day. This is what I had to eat at Fisherman’s Wharf, a major tourist destination in San Francisco. You could call it cuisine, but junk food might be a better way to put it. In the picture, you can see that I had fried whitefish as well as fried shrimp. The fried whitefish was juicy and the fried shrimp had a tender texture, both of which were amazingly delicious. The batter had a slightly different flavor than when you get it in Japan. But, I still thought that it was delicious enough to introduce to Japan. The number one spot goes to the cheesecake at The Cheesecake Factory, which is also pretty well-known in San Francisco. I was there sometime during the evening and had to wait over an hour, but it was well worth the wait! First off I decided to go with the steak, since I knew that America was the place to get it. And then for dessert, I decided to order some cheesecake. 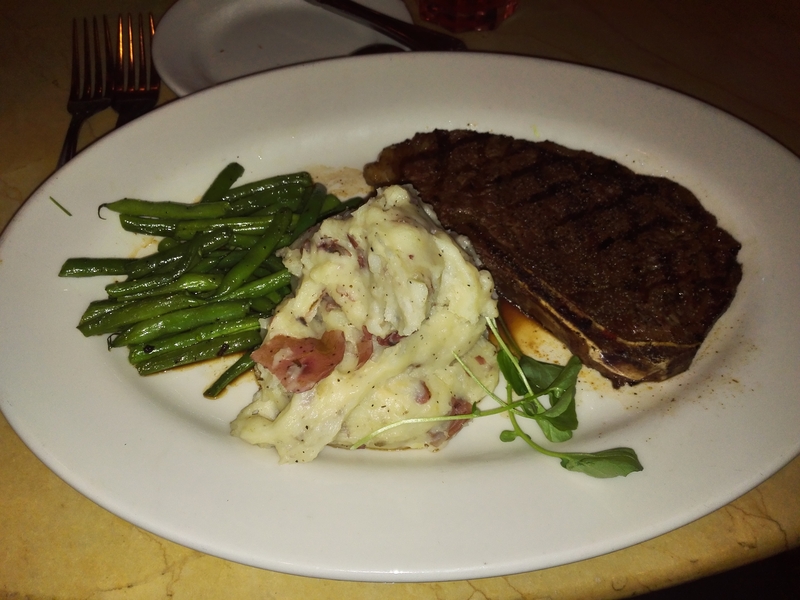 The steak was incredibly delicious, but the cheesecake was something else entirely! It was the best cheesecake I’ve ever had in my life. I think it was called “Godiva Chocolate Cheesecake” or something like that. It was more like chocolate cake than cheesecake, and I was completely blown away the instant I took my first bite. It had a rich chocolate taste that was full of flavor. I was so thrilled by its amazing flavor that I couldn’t help but say “delicious” out loud to myself. I think it’s safe to say that you should definitely come to eat here if you’re ever in San Francisco. Well, that’s it for the top 3 best things I ate in San Francisco. There didn’t seem to be many Japanese restaurants in San Francisco, which meant that I really started to miss Japanese food after being there for an entire week. I think I better bring some instant miso soup with me next time!